Scientists have discovered a new method of creating human stem cells which could solve the big problem of the large-scale production needed to fully realise the potential of these remarkable cells for understanding and treating disease. The discovery has been made by a team of scientists at The University of Nottingham, Uppsala University and GE Healthcare in Sweden. 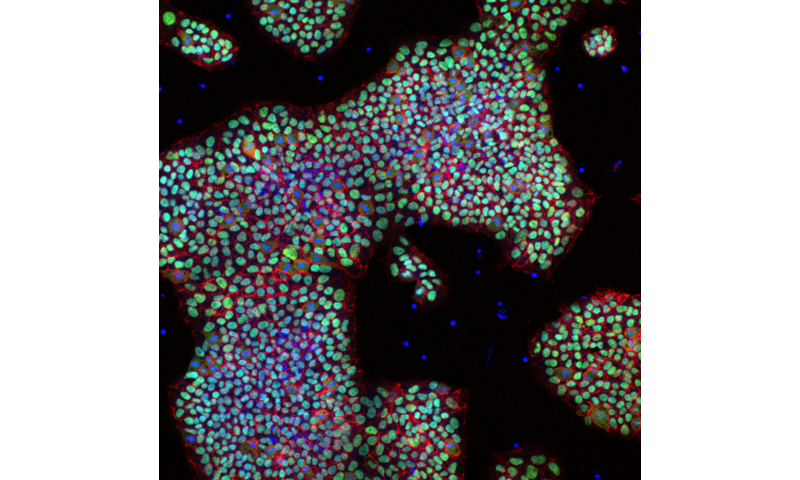 Human pluripotent stem cells are undifferentiated cells which have the unique potential to develop into all the different types of cells in the body. With applications in disease modelling, drug screening, regenerative medicine and tissue engineering, there is already an enormous demand for these cells, which will only grow as their use in the clinic and by the pharmaceutical industry increases. However, production of stem cells at the scale required for optimal application in modern healthcare is currently not feasible because available culture methods are either too expensive, or reliant on substances that would not be safe for clinical use in humans. In this new piece of research, published on Wednesday July 13 2016 in Nature Communications, a team combining researchers from The University of Nottingham's Wolfson Centre for Stem Cells, Tissue Engineering and Modelling, Uppsala University and GE Healthcare have identified an improved method for human stem cell culture that could lead to quicker and cheaper large scale industrial production. The work was started at Uppsala University in Sweden, and the first author, Dr Sara Pijuan-Galitó, is now continuing her work as a Swedish Research Council Research Fellow at Nottingham. Sara said: "By using a protein derived from human blood called Inter-alpha inhibitor, we have grown human pluripotent stem cells in a minimal medium without the need for costly and time-consuming biological substrates. Inter-alpha inhibitor is found in human blood at high concentrations, and is currently a by-product of standard drug purification schemes. "The protein can make stem cells attach on unmodified tissue culture plastic, and improve survival of the stem cells in harsh conditions. It is the first stem cell culture method that does not require a pre-treated biological substrate for attachment, and therefore, is more cost and time-efficient and paves the way for easier and cheaper large-scale production." Lead supervisor Dr Cecilia Annerén, who has a joint position at Uppsala University and at GE Healthcare in Uppsala, said: "As coating is a time-consuming step and adds cost to human stem cell culture, this new method has the potential to save time and money in large-scale and high-throughput cultures, and be highly valuable for both basic research and commercial applications." Co-author on the paper Dr Cathy Merry added: "We now intend to combine Inter-alpha inhibitor protein with our innovative hydrogel technology to improve on current methods to control cell differentiation and apply it to disease modelling. This will help research into many diseases but our focus is on understanding rare conditions like Multiple Osteochondroma (an inherited disease associated with painful lumps developing on bones) at the cellular level. Our aim is to replicate the 3 dimensional environment that cells experience in the body so that our lab-bench biology is more accurate in modelling diseases." Dr Sara Pijuan-Galitó has also been awarded the prestigious Sir Henry Wellcome Postdoctoral Fellowship. This will enable her to combine Inter-alpha inhibitor with improved synthetic polymers in collaboration with other regenerative medicine pioneers at the University, Professor Morgan Alexander and Professor Chris Denning. This team plans to further improve on current human stem cell culture, designing an economical and safe method that can be easily translated to large-scale production and can deliver the billions of cells necessary to start taking cellular therapeutics to the individual patients. An embargoed copy of the full Nature Communications research paper 'Human serum-derived protein removes need for coating in novel defined human pluripotent stem cell culture' is available from the contacts below. The technology described in the paper is undergoing patent protection by GE Healthcare who co-funded the project at Uppsala University (WO2014158089A1).